September is National Animal Pain Awareness Month. It’s a time to raise awareness about pain and pain management in our furry friends. 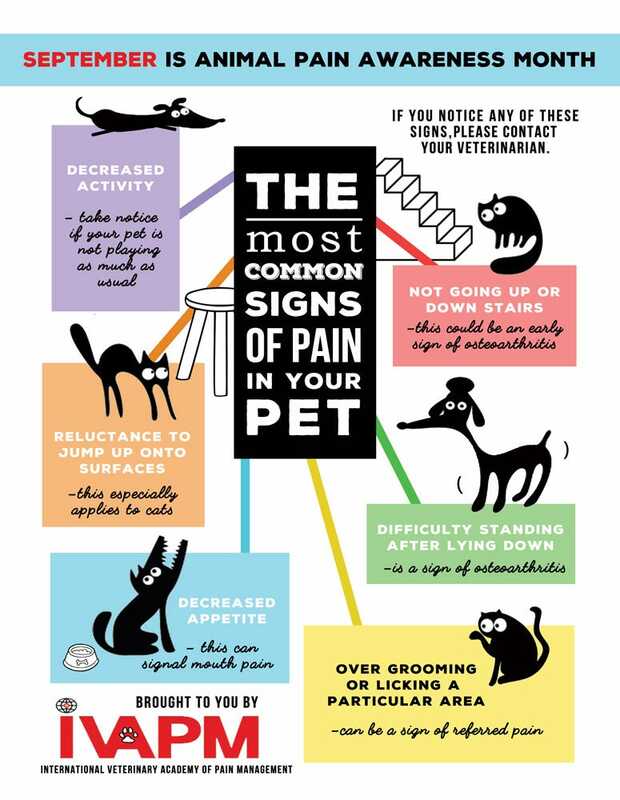 Let’s look at the signs your cat has arthritis. We’ve decided to focus on one of the most common types of chronic pain in cats, arthritis. The signs and symptoms of arthritis are better known in the canine community, which leads many to assume the condition is more prevalent in dogs. Unfortunately, arthritis affects cats at similar rates, but cat owners aren’t as aware of the disease, so they often don’t address it until it’s in its later stages. Arthritis is inflammation of the joints, which causes pain and reduced mobility. It can be caused by injury, infection, an autoimmune disorder, or degenerative disease. Healthy joints have smooth surfaces that easily glide for painless movement. In the case of osteoarthritis, the most common form of arthritis, the ends of the bone at the joint become roughened: The cartilage between the bones thins, fluid builds up in the joint, and small bony growths form, reducing joint mobility and causing pain during movement. Arthritis progresses slowly, so it can be difficult to distinguish symptoms from normal behavior. It’s common for cat owners to observe behavior changes, but dismiss them as normal signs of aging. Coupled with the characteristic way cats conceal their pain, it’s easy to understand why feline arthritis is so undertreated. Regular vet check-ups can help identify symptoms early on, and X-rays can reveal if bony growths or joint abnormalities are present. Arthritis is a progressive disease, which means it worsens over time, so it’s best to treat as early as possible. Keep an eye out for these (often subtle) changes in behavior, which may indicate your cat has arthritis and needs to go to the veterinarian. The earlier arthritis is detected, the more promising treatment is. As the International Veterinary Academy of Pain Management says, their pain is our pain. Share this article to help raise awareness about animal pain disorders to reduce suffering and improve the lives of our furry friends!